In order to grasp the essence of the Royal Oak Offshore Selfwinding Tourbillon Chronograph, you need to pick up the watch with your eyes closed and only open them after turning it over. Housed within a case that strongly hints at its innate sturdiness, protected by a sapphire crystal and a solid back secured by eight polished steel screws, a true masterpiece is revealed: the new selfwinding Calibre 2897, equipped with a tourbillon and a chronograph. A set of 335 parts on which the manually adjusted, corrected, bevelled and decorated surfaces create a shimmering play on light and shade. The automatic winding is ensured by a peripheral oscillating weight, while its chronograph is equipped with a column wheel and its tourbillon optimises its rating precision. The Royal Oak Offshore Selfwinding Tourbillon Chronograph is in harmony with the finest watchmaking traditions, and yet turning it over reveals an eminently contemporary spirit. 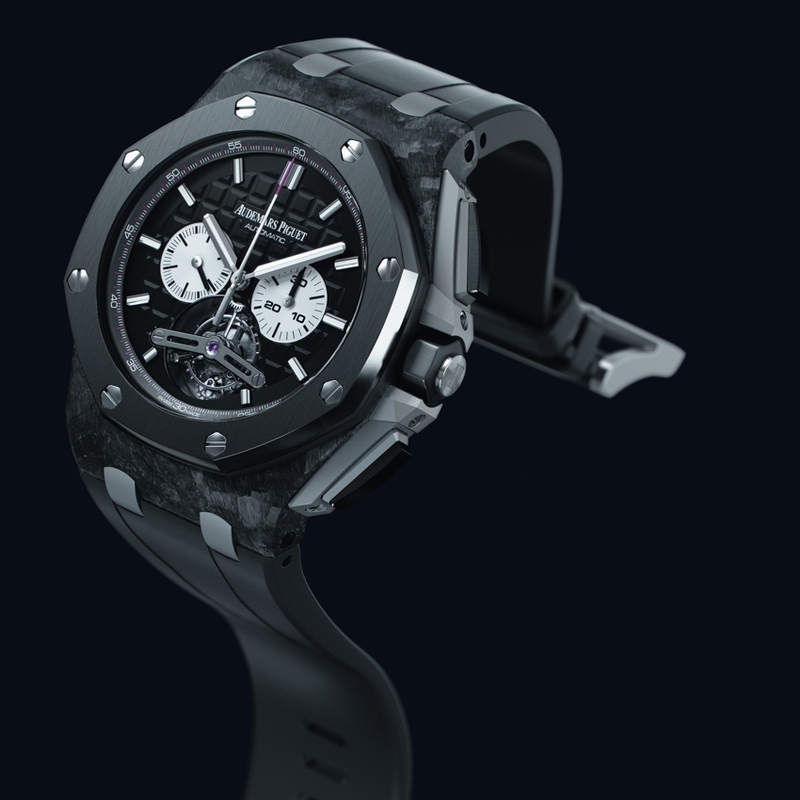 It displays a sophisticated and powerful design, that of the legendary Royal Oak Offshore collection, supported by a combination of black-coloured materials: forged carbon for the case middle, ceramic for the bezel and rubber for the strap. A watch with two faces, an encounter between contrasts or a watchmaking union of opposites, the Royal Oak Offshore Selfwinding Tourbillon Chronograph is an amazing blend of two worlds. Calibre 2897 is a selfwinding movement entirely developed and produced by Audemars Piguet. It combines a tourbillon and a column-wheel chronograph. Its architecture is a tribute to the past. The rounded cut-out of the bridges, the S-shaped lever, the curves of the minutes-counter bridge and the characteristic toothing of the column wheel: everything about this mechanism displays consummate artistry, to the point of making us almost forget the functional aspect. The finishing of the various parts is also loyal to the grand traditions of Fine Watchmaking. Several surfaces shine with a perfect polish, known as a mirror or specular polish, which catches the light and results in exceptional optical effects achieved by various polishing operations involving a succession of files, buffs, burnishers and various abrasives. On all the interior and external corners, the sharp edges between the surface and the flanks are cut down to form polished bevels. This is the meticulous operation known as bevelling or chamfering, and which is entirely performed by hand on all parts. The bridges and mainplate are rhodiumed, bevelled, circular-grained, beadblasted and hand-drawn with file strokes. After each of the parts is finished and decorated, the watchmaker performs a first “trial” assembly in order to set them into motion. Everything is then dismantled and each part is meticulously cleaned, before proceeding to final assembly and casing up. It takes around 15 days to produce a finished movement, which is then subjected to a number of different tests. Automatic winding is ensured by a peripheral oscillating weight in 950 platinum, mounted on ball bearings. This choice serves to shift the weight of the rotor to the outer edge of the movement, thereby improving winding speed. A recess has been made in the case middle so as to ensure that this 180° oscillating weight can rotate a full 360°. It is also worth specifying that this large 180° segment is optimally sized to enhance the efficiency of the automatic winding. Moreover, because of its position on the periphery of the movement, it does not increase the overall thickness, which enables the movement to maintain a slimmer profile. It also offers the additional aesthetic advantage of entirely freeing up the reverse side of the  movement and thus providing full views of the  mechanism, and particularly its column wheel, through the transparent back of the watch. Very few watch brands are capable of making their own tourbilllons. 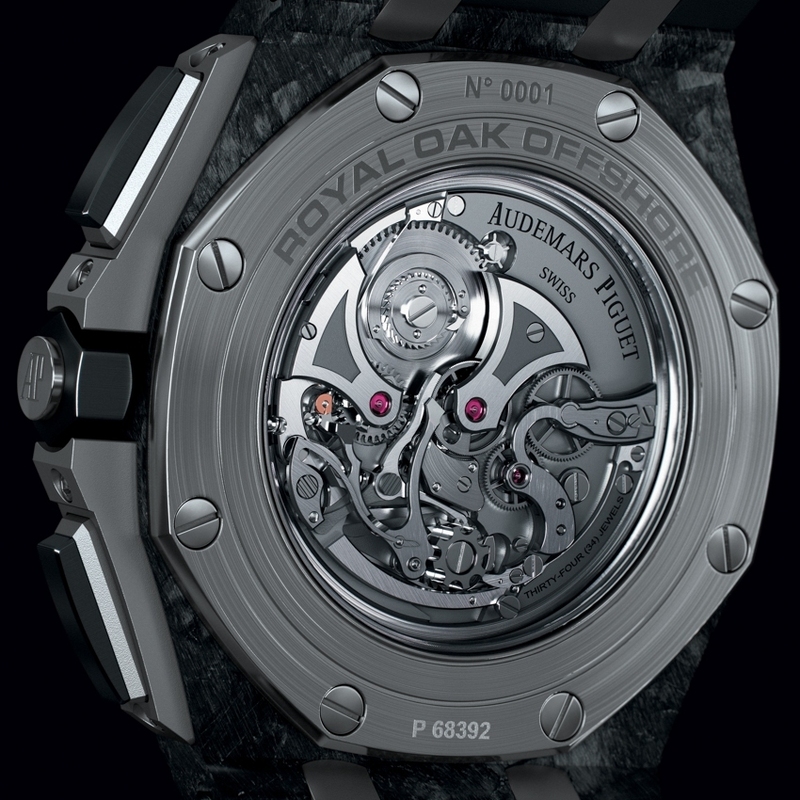 An acknowledged member of this select circle, the Manufacture Audemars Piguet has become a master in the art of defying the effects gravity and has over 16 movements equipped with a tourbillon. In 1986, it was already the first brand to offer an ultra-thin selfwinding tourbillon wristwatch. Representing watchmakers’ response to the laws of gravity, this invention serves to cancel out the disturbing effects of gravity on the movement’s most sensitive organs – the balance and spring assembly and the escapement – and to thereby achieve enhanced timing precision. To compensate for these disturbances, these organs are housed within a tiny feather-light mobile carriage that spins on its axis once a minute. The tourbillon with its blackened titanium bridge is visible through a dial cut-out at 6 o’clock. Setting this tourbillon into motion represents a formidable technical challenge. A weight of just 0.017 grams serves to balance the carriage weighing a mere 0.45 g. Meanwhile, in terms of the lightness of the regulating organs themselves, the escapement weighs just 0.12 g. The experienced watchmaker devotes almost three days to assembling its 85 parts, while the overall movement takes over 15 days. Calibre 2897 reveal its column wheel, an attribute of the finest mechanical movements and which serves to coordinate the start, stop and reset phases. An ingenious coupling yoke principle has been developed in order to avoid the chronograph hand jerking when the timing begins, a characteristic flaw of this type of mechanism. The development engineers have added a hook to the coupling yoke which thereby displays enhanced shock resistance when the chronograph is activated. The meticulous assembly and adjustment operations are entirely performed by hand and require particular care. The activation of the chronograph functions is thus carried out progressively in order to enable gentle and accurate tactile perception. 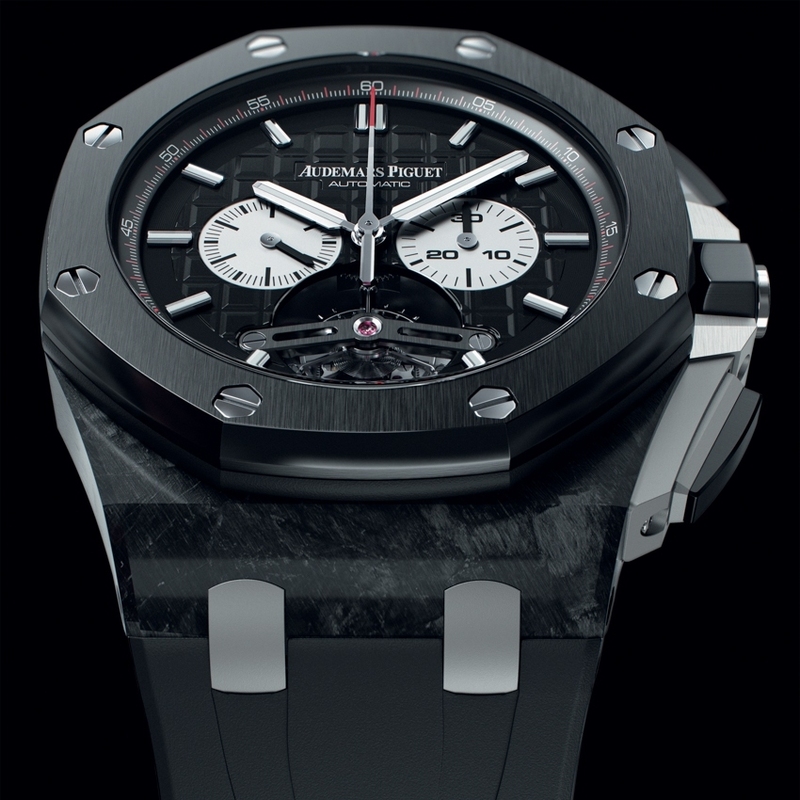 The name Royal Oak Offshore has become a watchmaking legend synonymous with sporty masculinity. Once again, connoisseurs will delight in recognising the octagonal bezel punctuated by its eight trademark polished steel hexagonal screws. The bezel is reinforced by the choice of black ceramics and by its finishing, in which the vertical satin-brushing of the surface makes a powerful contrast with the polished chamfers in order to sharp edges and clean-cut angles. The characteristically imposing and noble case middle is made from forged carbon. While ceramics is known for its resistance and hardness, forged carbon is extremely light. This material widely used in the field of aeronautics was introduced by Audemars Piguet into the world of fine watchmaking. The technical nature of the details on the right side of the case further accentuate the case middle. The pushpieceguards are not part of the case but consist of two titanium parts secured to the case by four visible  screws. The pushpieces themselves are composed of two parts: a base and a top that serves as a contact surface. Finally, the dial features the signature “Méga Tapisserie” motif symbolising this collection, composed of straight parallel lines and taut shapes. Its 6 o’clock opening serves to reveal the tourbillon. Even the grooved rubber strap complies with the established Royal Oak Offshore codes. Black with exclusive “Méga Tapisserie” motif, silver-toned counters. Applied and facetted white gold hour-markers with luminescent coating. Black flange. White gold facetted hour and minute hands with luminescent coating. Black rubber, adorned with two grooves. Titanium pin buckle.